The search engines rank pages differently, and the UCSB index only crawls my site on request. Germany since 1945 lecture course at UC Santa Barbara since 2004. What was the assignment? 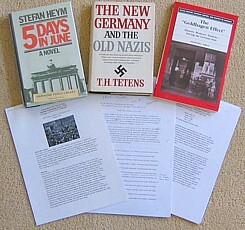 Basically, to summarize and examine a book on post-1945 German history, using concepts from the course. For details, see the 2007 Book Essay handout (2006 version), and 2007 Web Publication guidelines (shorter 2006 version). How did the students choose the books? In 2004 the students chose the books themselves; in 2006 I also supplied a few suggestions; in 2007 I had a more detailed page of book suggestions. I trying to offer both new books and important older books. I also suggest more arcane titles when students come to me with specific interests. Which student essays were selected for web publication? In 2008, 39 (29+10 conditional) of 50 qualified for the web option, and 35 ultimately chose it. In 2007, 27 of 45 qualified for (B+ or better on paper), and 23 ultimately chose this option. In 2006, 19 of 32 qualified for (B+ or better on paper), and 17 ultimately chose this option. In 2004, 12 of 33 students opted to meet the earlier deadline and do the additional editing and bibliographic work to have their papers published here, while 4 more students submitted their papers at my request (15 total). Can I cite these essays? Yes, just as you can cite anything you find on the internet. But do not quote from them or otherwise use the text unless you cite them ! See my plagiarism warning, below. How are the essays arranged on this page? I'm trying to think of a better way, but for now each course has its own table of links: 2004-16 essays, 2006-17 essays, 2007-23 essays. The headings on the left offer a general content guide, but the best way to find something (like your name) is to do a page find (ctrl-f in most browsers). Google indexes them, so if you are searching for a particular book, you may find one of these essays among your search results..
Plagiarism—presenting someone else's work as your own, or deliberately failing to credit or attribute the work of others on whom you draw (including materials found on the web)—is a serious academic offense, punishable by dismissal from the university. It hurts the one who commits it most of all, by cheating them out of an education. I report offenses to the Dean of Students for disciplinary action. Screenshot of Integrity Pledge on GOLD that all UCSB students must acknowledge. Princeton plagiarism page with 3 commented examples.